I met this man by chance back in 2001 when I was working as a senior supervisor at a hotel in marble arch. he was a guest speaker at a dinner banquet for some company. I was in and out as I was on duty but caught alot of his talk and was mesmerized at his knowledge and stories of his life. he was signing his autobiography after the talk and dinner which was a slight update from the original published in the late 80s. I cant remember how much it was but it was a well decent price, i got one for me and one for my grandad. its a brilliant book. 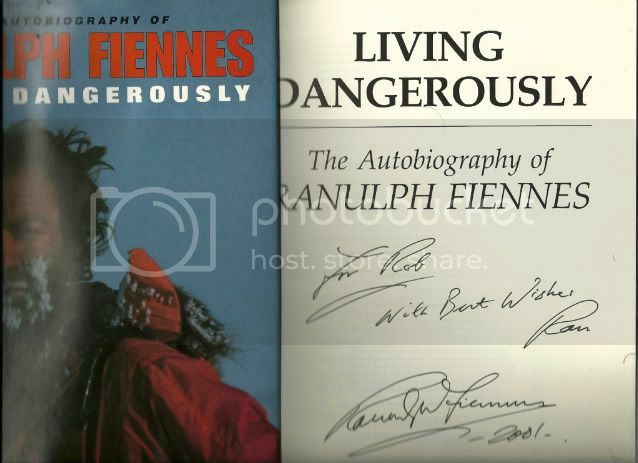 I see he has since released another autobiography, mad bad and dangerous to know, does anyone know if this is the same autobiography as living dangerously but carrying on from where it left off or a complete re written account? it would be fantastic to meet him again. true legend. apologies for the quality of the scan, was trying to get as much of the front cover in with it lol, so its a bit smudged.